Like Nice with it’s Promenade des Anglais the Croisette at Cannes is the main showcase with magnificent hotels and flowered boulevard. The world famous beaches of Cannes are situated along La Croisette. Unlike Nice with it’s pebble beach, Cannes has golden sand which is actually imported mainly from Frejus. 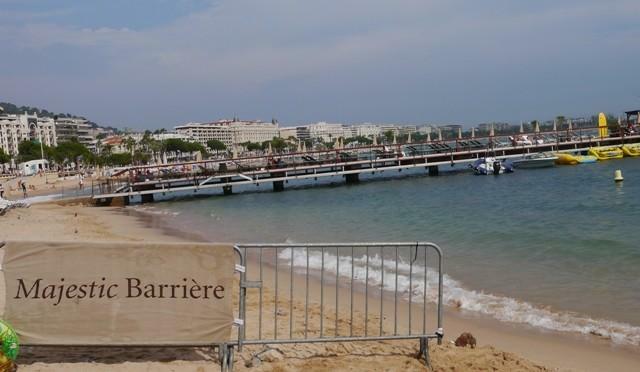 There is an underwater barrier which acts like a coral reef to prevent massive waves hitting the beach along the Croisette in the winter and washing away the sand. The barrier is unique in the south of France. There are public areas amid a succession of private beaches belonging to the famous hotels such as the Majestic, Carlton and Martinez. At one end of the Croisette is the Palais des Festivals which has a large public beach adjacent to the building. At the other end of the Croisette lies the Palm Beach Casino. There are miles of fine sandy beach both centrally at the Croisette and at the West and East of the Croisette. At the far ends of the central Croisette you will find two public beaches which can get very crowded in the summer months. The town has planted palm trees on the public beaches to provide welcome shade. On the public beaches such as Plage Mace, you will be able to hire sun beds and parasols. The rest of the Croisette is sectioned into over 20 paying beaches. The locals will also head for the miles of public beach along the boulevard du Midi and les Rochers adjacent to La Bocca station. Many of the hotels in Cannes are affiliated with various beach clubs along the Croisette and you may be able to get preferential rates when using the facilities of the clubs.